← National and regional preparedness events this week! Do you have thoughts or questions about the Seattle city budget as it relates to emergency preparedness? 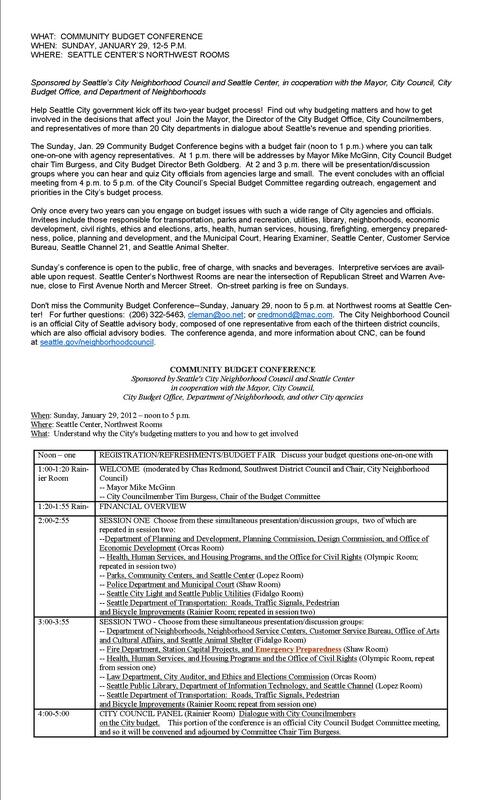 If so, you’ll have an opportunity this coming Sunday, January 29th, to voice them to city leaders at the Community Budget Conference from noon to 5 PM at the Seattle Center. Following is the event overview and agenda (in both .jpg and .pdf format). The segment on Emergency Preparedness is in Session 2 which starts at 3 PM in the Shaw room. As noted in the overview, it’s open to the public, free, and on-street parking is also free on Sundays. Hope to see you there! This entry was posted in Announcements, Events and tagged Community Budget Conference, emergency preparedness budget. Bookmark the permalink.